Skansen Hotel Stavanger, Hotel Norway. Limited Time Offer! Skansen Hotel. "Skansen Hotel" has 2 stars. 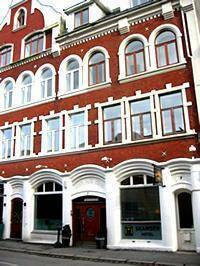 This hotel is a perfect place to stay when exploring Stavanger. The nearby train station makes "Skansen Hotel" easy to reach. The accommodation has a total of 28 bedrooms. Visitors are offered the opportunity of taking part in fishing. For guests who like taking part in some sports, "Skansen Hotel" also offers golf. No need to leave the comfort of the accommodation for dinner as there is an onsite restaurant. After dinner, you can have a drink at the lounge bar. In the morning, guests can have breakfast, which is included in your stay. Business travelers will appreciate the free Internet access.